For a peaceful hike, a family outing, an exploration of the area’s rich history, or all of the above, the 800-acre Great Falls Park is a can’t miss. Great Falls Park features extraordinary views of the Potomac River and Great Falls, along with 15 miles of hiking trails, and five miles of horseback riding and biking trails. 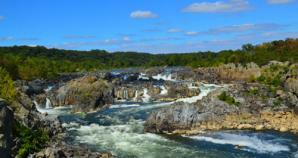 Be sure to add a trip to Great Falls Park to your itinerary as part of your vacation to Fairfax! Whether you're with family or friends, or simply a local looking to make an exciting and fun day trip, Great Falls has gorgeous scenery, rolling rapids, and miles of nature to explore.